#7122 newly painted in the Car Shop, November 2008. #7122 at North Freedom, April 2000. The railroad refrigerator car could be called America’s “ice box on wheels.” Invented some 150 years ago, the car was designed to haul perishable goods such as meat, dairy products, and beer–virtually any foodstuff that required a cool temperature. The carbody was well insulated and the interior cooled by ice stored in bunkers at either end of the car. Salt was sometimes placed in the bunkers to accelerate the melting of the ice and lower the temperature of the load. 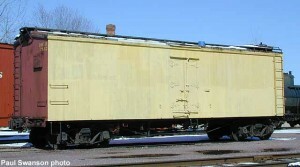 Reefers had a limited time of effective cooling and required re-icing if they traveled greater distances. Railroads had to construct massive icing platforms and ice storage facilities to service the cars at major terminals and other strategic locations. The refrigerator car was a major factor in the development of large farming areas in remote regions of the U.S. as it allowed the product to be shipped great distances to major markets. The citrus and vegetable industries of the Southwest were largely developed after reefers came into use. In later years, private companies owned and maintained their own fleets of reefers for shipping of meat and other food products. Often, railroads operated special expedited unit trains of reefers to keep the cars moving and reduce icing stops. By the late 1950’s, railroads began replacing ice bunkers with mechanical refrigeration, thereby elimating costly icing facilities and extending the travel range of the car. Reefers are still used today, although not as widely, as most produce now travels by truck. Duluth & Iron Range #8022 was built by the little-known Peteler Car Company of Minneapolis, Minnesota in 1912. The D&IR’s purpose was to haul iron ore, and lots of it. #8022 was used to ship potatoes from the Iron Range area to market. It actually performed a reverse function in keeping the product warm from the freezing climate of the northern Minnesota where D&IR operated. In 1912, automobile roads were poor or non-existent, and the railroad was the main source of transportation. D&IR also provided passenger service to its online comunities, many of which were company towns. In 1938, the car was renumbered to DM&IR #7122 after the consolidation of D&IR and DM&N. It remained on the railroad until 1975, although it is not known if the car was used in service until such a late date. The Lake Superior Museum of Transportation acquired the car in that year and it remained in storage at Duluth. 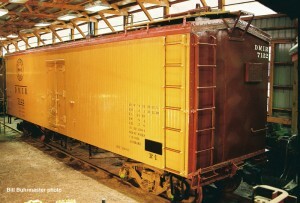 In June of 1998, the car was purchased by Mid-Continent to suppliment our freight car collection. The car was restored to its DM&IR appearance and is now on display in the Coach Shed. The Duluth & Iron Range was chartered in 1874 to tap newly discovered iron ore deposits at Babbitt in northeastern Minnesota. Ten years later, the first train was operated to the new ore docks on the shore of Lake Superior at Agate Bay (later called Two Harbors). Additional branches were later built to Duluth and another mine at Ely. The railroad soon came under the ownership of a parade of steel companies that used the iron ore from the Mesabi Range. In 1901, U.S. Steel acquired the D&IR and its neighbor Duluth Missabe & Northern. The two roads continued to operate separately, but consolidation was inevitable. On January 1, 1930, DM&N leased the D&IR and the two roads were quickly merged to increase efficiency. Duplicate facilities were eliminated and equipment was jointly used. In 1938, the merger was completed when D&MN’s successor Duluth Missabe & Iron Range acquired the D&IR outright. From that point on, both railroads were known as the latter. DM&IR continues to haul iron ore to the port of Duluth to this day.